Kawasaki Heavy Industries will spend about $211 million on measures that will help them shave 15% off production costs for the Boeing 777X airplane’s fuselage front sections, cargo doors and wheel wells. Boeing has asked suppliers to make parts at costs below those for the existing 777 jet. The American aircraft manufacturer has already landed orders for nearly 300 units of the 777X. The airplane is scheduled to debut in 2020, and aims to win new orders exceeding the 1,500 mark. The $211 million will be invested in Kawasaki Heavy’s main Nagoya Works 1 and the Gifu Works, which handles fuselage panels. More automated facilities will be installed to improve transport efficiency and reduce the steps involved in production, the company stated. Kawasaki Heavy will also develop a special robot to replace the foreign-made fuselage-processing equipment. It will modify articulated welding robots supplied to automakers. The company will take a call on whether to build a new factory or renovate existing buildings for the equipment upgrade, by the end of fiscal 2014. In a similar effort, Boeing is using robots to assemble 777 fuselages to drill about 60,000 holes per fuselage and install the necessary fasteners. It increases the efficiency and quality of building aircraft and also reduces the number of people needed to build the planes. Boeing also plans to deploy robotic assembly technology on the 777X that will dramatically change the way the plane’s metal hull is built. 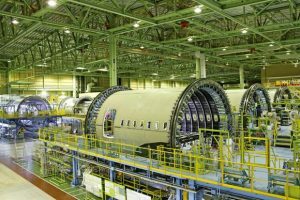 The new automation technology, replacing a crane and a giant cylindrical fixture now used to laboriously turn the half-built fuselage midway through its production. The technology was refined and tested last year in a secret facility in Anacortes, Washington. Kawasaki Heavy will also launch an aircraft engine repair and maintenance business. Engines developed and built with partners such as Rolls-Royce will receive anti-friction treatments to prolong their lives. Repair services will also provide fat margins for Kawasaki Heavy. The company plans to team up with carriers such as Japan Airlines and ANA Holdings, as it seeks to tap the growing aircraft industry, aiming to boost sales of aircraft transportation systems to $4.05 billion by fiscal 2018 – 25% above the fiscal 2013 level.